But first, Santiago, Concepción, Temuco, Los Ángeles, Lima, and Machu Pichu! I can't quite believe that this is my last email home in the mission...I've got a lot of mixed feelings. It doesn't quite feel real, so I can't really say this is difficult or easy or anywhere in between, it just is I suppose. I suppose it would be more difficult if it were more sudden, but since I've been expecting it for a while and preparing for it, I'm trying to take it as just another step forward. 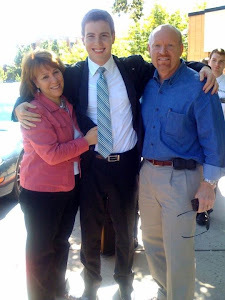 As I think about not being a missionary anymore, it is sad. But, it is comforting to know that I can still reach the celestial kingdom, even if I'm not a full-time missionary for the rest of my life. Haha, it's good to know that the Lord has more plans for me within his great big plan for our salvation and happiness. I can't think of a better way to have finished my mission that with general conference (it being my 5th general conference in the mission by the way. woah..). I went with many questions, like, "How can I continue to serve in the Church? How can I have success as a member missionary? How can I apply all that I've learned in my mission to the real life? How can I continue to be constant? When and whom should I mary? How can I increase my faith and works? Which profession should I select? I'm happy to announce that every single one of these questions (and more) were answered by the voice of the Spirit in a very remarkable personal way. The conference really helped me see what the next years of my life will look like, as the consecrated and devoted member and disciple of Christ I desire to be. I learned a lot about what sanctification means and what it entails as a regular member. I realized (as I had earlier in the mission), that no body becomes sanctified on accident. It is always a choice we make. And we must all consciously make it eventually, or we will always live beneath the level of our potential and our privilege. I am thoroughly excited to be an everyday member, but with the capacity to see miracles every day in my life. I desire to give my life to the service of the Lord. I know that the mission does not end here. It is every day. I know who I am. I know where I'm going. I can see it, I can taste it, and I have the desire to acheive it, with God as my motor and the Spirit as my lamp. I love the Savior. He has saved me countless times from my sins. I love His work. I love His church. How greatful I am for the time He gave me to serve by His side. And what makes me even more greatful is knowning that I can continue to do so. His work is not over, and neither is my part in it. I know Christ is our savior, that this is His true church. I declare that The Gospel was restored through the prophet Joseph Smith, that the Book of Mormon is a solemn and powerful witness of Jesus Christ. I can declare, as did Paul, that I have fought the good fight, I have finished the race, I have kept the faith. I pray we all forever do the same. That sounds familiar... That's what this week is for me. This is my last full week of missionary service in a specific area, although I will still happily be a missionary until 6:30pm on the 18th. Every week, every day, every moment is a decision. We constantly choose things, wherein we learn how to exercise our agency. This last week, I make my decision to follow Christ and work as hard as I can. There is nothing sweeter than being made an instrument in His hands, through righteousness and diligence. We had ZL/DL Council today, so I'm bummed I can't spend more time to write a nice second-to-last letter, cause we have to go get on a bus to Temuco (we're in Concepción). It is what it is. Gosh...I don't know what to say. My head is full of a lot of thoughts. 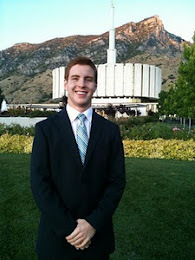 The mission is the MTC of life, and I feel like my real mission is about to begin. The feeling is very similar to when I left the MTC in Provo, only much more intense. I inform you that on the 10th, when you get in, President Martínez will be in Temuco doing interviews, so I don't exactly know yet when you'll be able to meet him. But I have my final interview with him this thursday, so I'm going to ask him how we can work it out, and I'll let you know. Could you send me a revised/finalized version of the itinerary? I'm still trying to make some final decisions about where to go and when while you're here, but I have a general outline. I think on saturday we'll stop by Lota for a little bit, and finish that night in San Pedro. Don't know where to stay the first day yet. Then, late that night, or early the next morning, we'll drive to Temuco to attend church in Padre Las Casas. Finally, we'll finish in Carahue, and stay the night in Puerto Saavedra with some members there. I might switch the order of days however, and go to church elsewhere, it all depends on specific people's availability. But I'll have it all worked out by the time you get here. Looking forward to it all! Your arrival, the trip, life, eternal life...it's all ahead of me. 2 And now, I ask, what great blessings has he bestowed upon us?Can ye tell? 3 Behold, I answer for you; for our brethren, the Lamanites, werein darkness, yea, even in the darkest abyss, but behold, howamany of them are brought to behold the marvelous light of God!And this is the blessing which hath been bestowed upon us, thatwe have been made binstruments in the hands of God to bring about this great work. Indeed, it is a great and marvelous work. of all your clever email subjects. After the mission, I'll surely be more creative. Thank you for your wonderful letters. Love the stories and the pictures. I'm feeling more calm now about everything. Just trying to stay as focused as posible while I try to make some plans for your arrival. I don't have anything set in stone yet, but I have advised most of the people I want to visit that we'll be there that saturday or sunday. The most exciting news of the week is the baptism and confirmation of Elisa. It turned out really really well, the whole service went smoothly, and Elisa looked really happy. Unfortunately, her parents weren't very much in agreement with her decision, and did not come to the service nor to church to see the confirmation, but we have hope that they will come to understand soon. In the mean time we're really happy for Elisa and this important step she has taken towards Christ. The weather's getting really beautiful here. It rains every now and then but nothing like before. You're really going to enjoy it. You picked a good time to come out. You don't need any kind of voltage converter, as one might suspect, because 99 percent of all devices now support duel voltage. You only need a small piece to change the plug. It looks like two tubular prongs. You can probably see what I'm talking about online. Hmmm...tips... Let me think. I don't know, just typical foreign country travel stuff. Keep your wallet in a safe place, etc. Chile's pretty modern, so there's not much you'll need that you won't be able to find here. Be prepared for really expensive gas... like almost double the price...and perhaps you can buy a simple prepaid phone or something. I don't know what you did in France, or if phone rates are expensive.. just a thought. Haha I know that wasn't of much help. If I think of anything important I'll let you know. We've got to be going now, but looking forward very much to seeing you! We went to Volcano Llaima today with the whole zone. It was a blast, and I have a lot more photos, but I might as well just show you in three weeks. Inside my mind I've been kind of a crying mess for the last 24 hours, although I don't show it. Last night, in Rocío's house we watched the video "I'll go where you want me to go" from the special Work of Salvation transmition, and watching the missionaries in the video made me realize, really realize, for the very first time, that this is all coming to an end, and I'll only be a missionary for 3 more weeks. I struggled to hold back tears as I testified to Rocío about the importance of the work. I feel excited to see you all and start a new chapter, but thinking about leaving all this breaks my heart into a thousand pieces. The only option is to give it everything I can these last few weeks and bring souls to Christ. Thanks for the great letters this week, I liked them a lot. Today is Chilean Independence Day, so nothing's open and we're using a member's computer to write, so I don't have much time. Happy 18th! and see you soon! So...here I am. Opening up the final chapter of my mission. All full transfers have come to a close, soon I will literally be completing 2 full years of misionary service, and this life I have loved so dearly is quickly passing away. I'm full of mixed feelings, but I try to put them out of my heart and head, preferring to pretend that every day is the first day, and that really I'll be here for another 2 years. I have four full weeks to dedicate myself to my Savior and my Chilean brothren, and I am committed to give it my all, come what my. With this recent transfer come interesting and exciting news. I have been "released" so to speak after a long journey as Zone Leader (more than half of my mission), and have been reassigned as District Leader, as they are combining the zones of Cautín and Labranza (the same stake, afterall), and the zone leaders will be over there. I feel a little sad that I won't be able to participate in the Lidership council my last month in the mission, as it has been something very special to me, but excited to learn new things and finish the race with a different perspective. I have a fantastic district, consisting of the 4 Sisters of my very own Maquehue ward, so it'll be nice not having to travel much, and being able to work more effectively together as a ward. They're great sisters, with a great vision of the work, and are having a lot of success recently. My new comp will be Elder Rivera, from Argentina. I don't know much about him, just that he's relatively new in the mission, and was trained by the other Elder Wilcox that used to be here. Elisa is progressing really well and has accepted to be baptised on the 21st. She invited us to eat lunch again with her family yesterday and afterwards we watched "Together Forever." It was a powerful moment, and really helped her parents realize it's time to work and make decisions. With tears in their eyes, and hopes of a happier family, they committed to going to church with Elisa next week. We're really excited. We also were given a miracle self-reference from the sisters the other day. His name is Manuel. Aparently he saw the sisters one day and went up to them, asking them if they could visit him soon. He belongs to our sector, so we went, and turns out Manuel has met with missionaries for about the last 5 years, has attended church many times, knows a ton, and has a testimony of the Church. He only hasn't been baptised, because he was always jumping back and forth from city to city for studies, work, etc. But now he's here in Maquehue more permanently, finishing up a doctorate. Long story short, he will be going to church with us next Sunday, and has decided to be baptised on the 28th. A true miracle. Finally, a long-term investigator we've had (Ximena) decided to be baptised by the end of the year. We're still working with her trying to help her to progress faster, and she's been making some big strides. A precious moment we had with her the other day was when she finally agreed to give the final prayer at the end of the lesson. It was a very simple, yet sincere prayer, but it was the first time we had ever heard her pray in front of us, and it truly brought tears to my eyes. I love Ximena and rejoice when she progresses, and I'm really hoping she can be baptised before I leave Chile. I'm pretty sure it would be one of the happiest moments of my life. So the work is great. God is good, and the Gospel is true! Awesome! I love you all and hope you have a fantastic week! P.S. I looked at the schedule of the Santiago Temple. Looks like everything should be okay, but I'll give them a call anyway just to be sure. our lunch schedule for the week. Notice sunday (domingo) where Elisa Bucarey signed up. Our golden investigator! With the zone in a restaurant in the famous Mapuche Market of Temuco. I'll have to take you when you come. You'll find the best magnets there, Mom. Is really awesome. I've been reading it a lot lately and am learning a ton. Since it's like 80 percent letters to recent converts, every page is just full of good advice about how to be a good saint and follow Christ. I feel like the Bible could be the "What" of the Gospel, announcing the message and telling us what to do. The Book of Mormon is easily the "why" as it explains the amazing plan of redemption and explains much more fully the bigger picture of it all. And I suppose the Doctrine and Covenants could be the "how," as it gives specific instructions on how to administer Christ's church in these latter-days. Together, the standard works and an insurmountable treasure, and I'm very grateful for them. Thank you for your letters this week. I laughed out loud at many of your witty comments. I have always loved the Wilcox family sense of humor, typically literary in style, but almost always mixed with hint of irony. Thank you for examples, as always, of living and loving the gospel of Jesus Christ day to day. The work roles forth hear. Elisa is progressing a ton, and seems like a natural in church now. She's still a little hesitant about when exactly to be baptised, as she's worried about the response from her parents. She and we all wish they would wake up a little bit spiritually, so they can see first hand the blessings it will bring to their lives..but step by step. We are positive Elisa will be baptised very soon. We found a great new investigator the other day that is the mom of two young people we taught a few times a few months ago. They are Camila and Thomas. The mom is Fabiana, and she truly is prepared to receive the Gospel. Yesterday, in only our second lesson with her, she began to cry as she thought about the very personal call the Savior was making to her to repent and come unto him. At the beginning of the lesson, as we read from 3 Nephi 11, we asked her to not be like the nefites in that occasion, and pay attention to the Spirit as it tried to speak to her. She did just that, and it was a very tender moment. She accepted the invitation to be baptised, hoping that she can do it with her children as well. More updates about Fabiana to come. That's about it for right now. I'm out of time. I love you all very much and wish you the best of Wilcox (and Felsted and Shannon) weeks! With some CINNAMON ROLLS that a sister made for us. Like the third time I've had cinnamon rolls in Chile. Rocío's baptism! Along with Pedro and Juan, who were also baptized. With Rocío and her two sons. The little girl is the Bishop's daughter that Rocío wants to marry her son haha. Nice 18 de Septiembre themed lunch. At Gatsby, an all you can eat buffet where we went for lunch today. Delicious.. Being close to it for like half my mission really makes me miss it here in hilly Padre Las Casas. Looking forward to the next beach trip in aproximately one year. Glad to hear you all had a great time, if not very busy with all the rugrats. The kids are adorable, and I can't wait to get to know them better. I'll go ahead, Dad, and start working on packing some simple things to send home. Sending them, as you know, is not terribly cheap (but actually not terribly expensive either), so if you can make sure I've got enough on the home card, I'll try and send some stuff out next monday. This week was good in the work of the Lord. We're progressing with the Bucarey family, despite their limited time schedule. Unfortunately the parents still have not attended church, as they like their sleep on Sunday mornings (worst excuse! ), but Elisa's, the oldest daughter, is doing GREAT and came to church for the second time yesterday. She really is incredible, one of the best investigators I've taught. When we were teaching her family on Saturday, she had already read all of the material, and knew it really well. She helped us teach her parents, haha. It was practically like teaching with an already-member. So we're really happy about that. The Adventist family, The Pacheco family, is progressing as well. Really interested in the Book of Mormon still and hopefully will attend church with us this sunday. Now we just gotta get their two kids to participate in the lessons as well. So that's the morning report. We're happy, working hard, looking for miracles, and seeing them. I appreciate your comments, Heather, about the importance of references. So true! So I want to hear experiences, if there are any! Was anybody able to use the phrase "that's what I love about my church" or something similar the other week? "Christ has invited and continues to invite us all to follow him. He stands where we must exercise our faith, and says "Come." Sometimes it's not easy. Sometimes the winds blow and the storm rages. Sometimes our faith falters. But EVERY time we say, "Senor, salvame," [Lord, save me] immediately He is there to pull us up."